Soccer Program will run from May 5th to June 23rd. Open to kids from 2 years old and up that live in the boundaries of the Auditorium Neighbourhood. Starts at 6:30pm and runs to 7:30pm. To all people in the Eastward area… as we are well aware, there have been a rash of garage, house, and car break-ins recently. Constable Kurtis Glode of the Waterloo Regional Police Dept has set up a community meeting for Thursday Sept. 18, from 6pm-8pm at Bethany Church on Lancaster. He would like to have as many people as possible from the neighbourhood to attend. The police department wants to discuss the situation and also advise all of what we as a community can do. Please share this meeting information with all your neighbours. Let’s make everyone aware of this important event and have a good turn out. September 14th, 1:30 pm Porch Party! Starting at 254 Lydia st.
Family Weekend Outdoor Party on Sunday! Join us for Family Weekend Outdoor Party in Knollwood Park at Sheppard School on Sunday at 2:30pm. Bring your skates for the outdoor rink, your toboggan for the hill, something to bbq for the grill and food for the buffet! Annual General Meeting Feb. 13, 2014! The Kitchener Rangers Hockey Club is proud to announce that they have partnered with the Auditorium Neighbourhood Association to erect a new Community Pavilion in the recently-rejuvenated Knollwood Park. The 2015 Centennial Pavilion Project will celebrate the 100th anniversary of our extraordinary neighbourhood, in the park located directly across from the Kitchener Memorial Auditorium. ‘‘We want to turn our park back into a harmonious greenspace that invites neighbours to spend time outside together to meet, talk, play, eat and enjoy,“ said Melanie Toolsie, the ANA project manager. The Rangers and the ANA will each contribute $25,000 to the project, which aims to be completed and inaugurated in Autumn 2014. The pavilion will be designed by local architect David Thompson to reflect the architectural esthetics of the neighbourhood, and will be built in cooperation with the City of Kitchener. “The Rangers are extremely proud to be a part of this Pavilion project” said Craig Campbell, President of the Rangers Board of Directors. Brian has organized the traditional ANA ski day at Alpine Ski Club (beside Blue Mtn up in Collingwood area) for Friday January 17, 2014 which is an elementary PD day. No need to pay in advance. You pay when you get to the club! You tell them you are with the ANA (Auditorium Neighbourhood Association Group). Feel free to invite friends and amigos. And if you do not want to ski … They also offer a $20 snow shoe package which include a ride up the big chairlift to the trails at the top of the escarpment. They would like me to tell them the approximate numbers of people attending. They have a great ski hill with varied terrain. 500+ feet of vertical. 120 acres of skiing and snowboarding. several lifts include a high speed 6-pack. 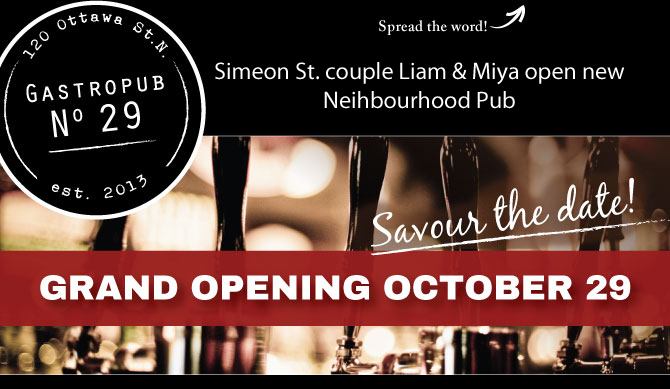 Your neighbourhood Gastropub is here! Get ready for a new food and drink experience! Gastropub No. 29 is a unique pub-bistro blend, where handcrafted classics, reinvented pub fare and craft beer meet a warm, casual atmosphere. Sounds awesome, right? It gets better. Gastropub No. 29 is a place for you to recharge, share the evening with someone special, fuel the family and talk hockey – before or after the game. Is there a better place to kick back and relax? We don’t think so. So stop by, and see for yourself. Savour the date. We can’t wait to see you there! PS. Want to get the latest Gastropub No. 29 news? Be sure to add eat@gastropubno29.com to your address book.